No matter what you do, you can’t keep up with your never-ending growing to do list. And now your to do list has turned into a giant monster. You know if you don’t do something, your to do list will eat you alive. If you can relate, no worries. We’ve all been there. I’d like to show you why Google Calendar is the best to do list app around. When I worked as a SAP system administrator for one of the biggest companies in Norway, I observed the employees that the company perceived as the most valuable employees. 90% of their work time were spent on meetings. They were all working insane amount of hours, and there was no real line between work and private life. They had multiple to do lists. I asked them if they had full control of ALL their to do list tasks divided among a gazillion different to do lists. They all gave me the same answer. Can you guess their answer? What’s the takeaway from this experience? You need to use ONE master to do list. If you don’t, you will basically never stop working because the tasks on your multiple to-do lists simply won’t get done. If you don’t keep track of ALL your tasks, then what’s the point in having a to-do list? You might as well go around with a crystal ball chanting some weird old wizard spell from The Lord of the Rings. It will just be a matter of time before your to do list tasks will drive you CRAZY. 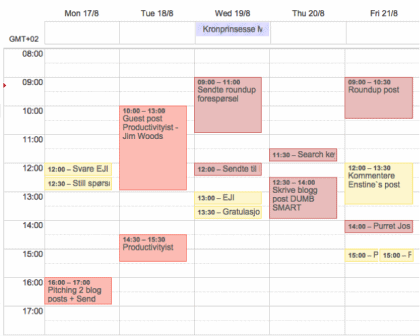 Before we dive into Google Calendar, let’s look at the problem at hand. I have tested most of the to-do list apps under the sun, including Wunderlist, Remember The Milk, etc. You must be able to know the date and time your task is due, and you need to be able to set an alert in advance. What is the point in getting an alert when the deadline is over? A good to do list app must include subtasks. Many of the tasks on my to do list have dependent subtasks. For example, let’s say the main task is to create sales for your business, and it consists of the following subtasks. Subtask 1: Find leads that are within your target market. Subtask 2: Research your leads. Subtask 4: Call leads and book meeting. Subtask 5: Prepare for the meeting. Subtask 6: Attend the meeting and close sale. 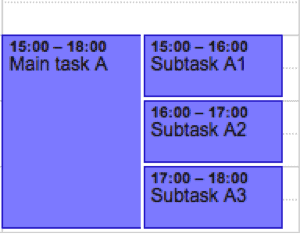 All the subtasks must be completed in the order from subtask 1-6 in order to complete the main task. You want to be able to keep a history log of the tasks you have completed. If you want to be successful with time management, you need to track how your time is spent. When you practice and improve this skill, you can be able to estimate planned tasks very accurate (+/- 10 minutes). Imagine how much better your planning skills would be if you set realistic deadlines for your tasks. And if had a rough week where you did not accomplish much work, you now how the ability to review which tasks were the problem and adjust accordingly. 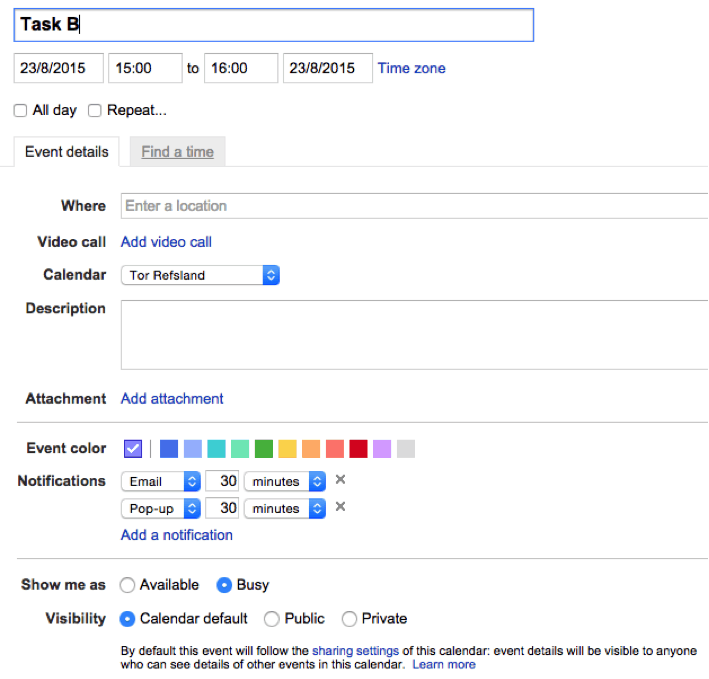 You want your tasks to appear on a calendar so you can easily see when a task should be started and completed. A calendar allows you to plan several days, even weeks in advance, where you can immediately find free blocks of time in your calendar. You’ll be spending some time with this app, so why not choose an app that is pleasing to look at? It doesn’t have to be perfect: just alright will do. If the app is not easy to use, you will not use it, right? It should have an intuitive feel, meaning there is no need to read a manual or go through a tutorial. In addition, since this is a work tool, you need the app to be efficient. You want to be able to create tasks with deadlines and get an overview of your to do tasks FAST. You want the app to be able to synchronize to other devices like Macs, PCs, tablets, mobile phones, etc. This means that you are not depending on any specific device, and if you lose one of your devices, you still have your to do list. Google Calendar is a part of the Gmail bundle, which is free. If you don`t have a Gmail account, you can register here. 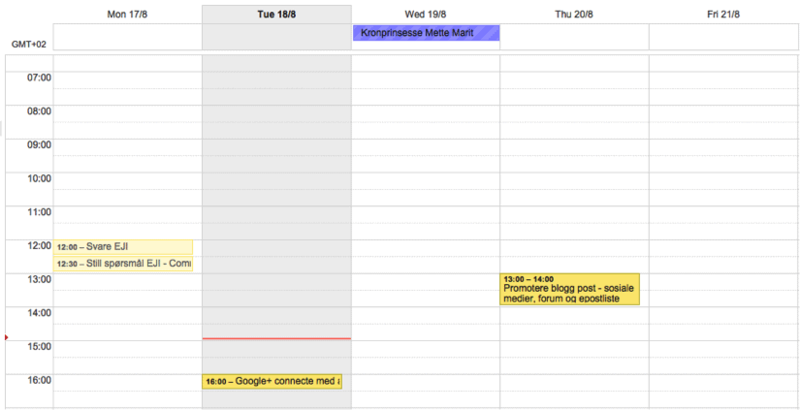 Once you have created your Gmail account, you can access the Google Calendar in the top right corner of the screen. Click on the “Calendar” logo. Congratulations! You have now accessed your Google Calendar. Note: When you use Google Calendar as your to do list, DON’T delete the tasks you have completed. If you scheduled a task for 30 minutes and it actually takes you 1 hour to complete, change the duration of the task to 1 hour. You will let the tasks in the past REFLECT the actual time spent. 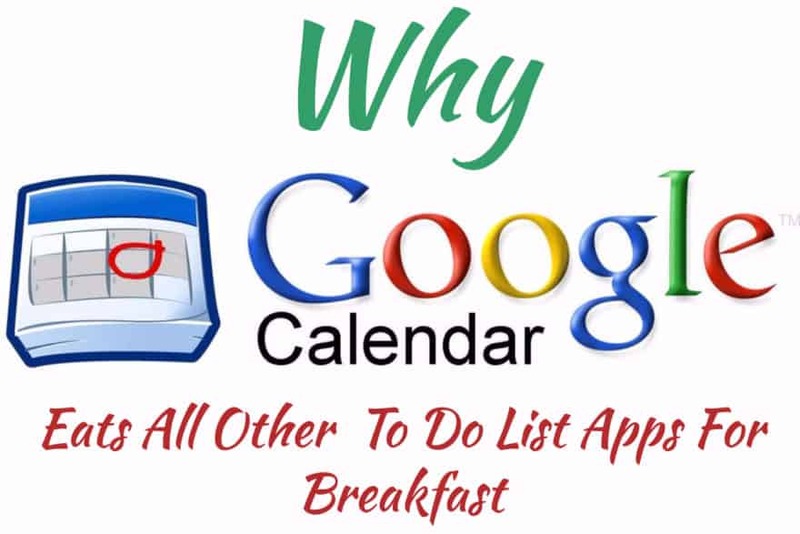 Let`s cut to the chase and take a look at the features of Google Calendar. First, I will show you how to create a new task with an alert. Click on a free spot on your calendar. 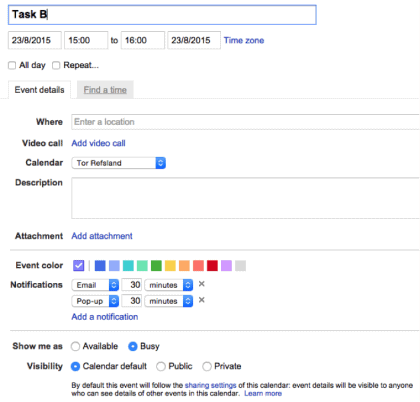 Enter the name on the task in the “What” field, choose the calendar you want to add the task to and click “Edit event”. Note: For more information about how you can use the calendar function to categorize tasks, look for the extra tip at the end of the post. Note that you can get notification X amount of minutes, hours, days or weeks before the deadline is reached. Email sends a reminder to your email. Popup makes a popup appear on your screen if you are logged on Gmail or if you have a calendar that is synchronized with your Google Calendar. Want to see past history? See the top left corner. Voila! You can see the exact tasks you have completed last week, and how long it took for you to complete every single one of them. 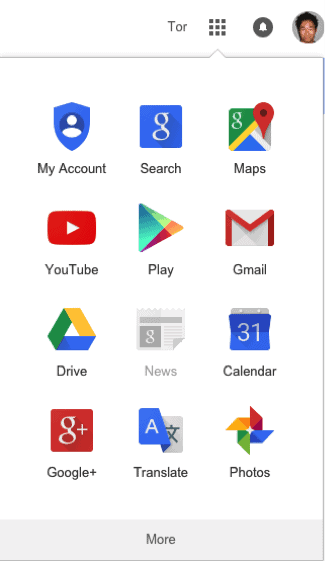 Absolutely–you can access your Google Calendar through Gmail.com via any device with an internet connection. Regardless of your phone using Android, iOS (Apple) or Windows operating system, you can download a calendar app for your mobile phone that will synchronize with Google Calendar. You can have different calendars, where each calendar will have its own color and represent a category. Your calendars will be represented on the left side. Do you want me to show you something REALLY cool? You can click on the calendars and choose to only display a few or one calendar, giving you a great overview over the tasks connected to a certain category (calendar). Example – displaying only one calendar/category. I have now only selected the “Promotering” (this is the Norwegian word for promoting) calendar, which displays all the tasks connected to this category/calendar. 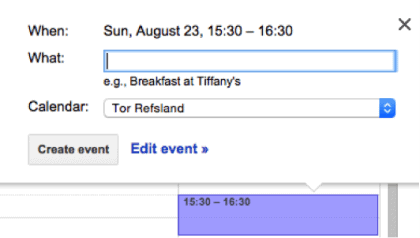 Now you have the recipe for how Google Calendar can help you save your sanity and take control of your to do list. Regardless, it doesn’t matter how good the recipe is if you don’t implement it. So start APPLYING it now and get control of your to do list! How do you keep track of your to do list?